A business organization, like a human body, is only as effective as its various processes. Pretty obvious, right? Yet, as V. Daniel Hunt demonstrates in this groundbreaking book, the failure to appreciate this obvious fact is the reason most reengineering schemes fail. Managers whose job it is to improve company performance, like physicians who work to improve patient health, must develop a clear picture of how each process fits into the overall organizational structure; how it ought to function; and how well it is performing at any given moment; before they can form a diagnosis or devise a treatment strategy. Fortunately, a powerful new analytical tool that has emerged in recent years helps you to do all of that and much more. Developed at General Electric, process mapping has been implemented in companies around the globe, and the results have been simply astonishing. Now find out how to make this breakthrough reengineering technology work for your organization in Process Mapping. The first and only hands-on guide of its kind, Process Mapping arms you with a full complement of state-of-the-art tools and techniques for assessing existing business processes and developing a detailed road map for ongoing change and improvement. Internationally known management consultant and bestselling author V. Daniel Hunt guides you step-by-step through the entire process. He helps you assess the need for process reengineering in your organization and determine whether or not a process map is what you need. He shows you how to create a process mapping team and helps you select the best-buy process mapping tools for the job. He explains how to gather vital information about your business processes via focused interviews and other interview techniques, and how to use this data in implementing process mapping. He also offers expert advice on how to apply your process map to significantly improve business functions and bottom-line performance. Hunt draws upon the experiences of companies around the world whose process mapping success stories will be a source of inspiration and instruction. You'll find out just how process mapping was put to use--and the results it achieved--at General Electric, IBM, NASA, Tandy Electronics, Shawmut National Bank, Fluor Daniel, Exxon, and other leading product and service firms. Find out all about today's most important new management tool and how to put it to work for continuous improvement in your organization in Process Mapping. Hunt also provides detailed case studies of product and service companies around the globe that have discovered the value of process mapping. You'll find out how General Electric, IBM, NASA, Tandy Electronics, Shawmut National Bank, Fluor Daniel, Exxon, and other leading companies achieved stunning results when they made process mapping part of their business improvement efforts. V. DANIEL HUNT, President of Technology Research Corporation, is aninternationally recognized management consultant, an emergingtechnology analyst, and the author of several bestselling books onquality, change management, systems engineering, and businessprocess reengineering. A short list of his clients includes JamesMartin and Company, Pacific Gas & Electric, ScienceApplications International Corporation, Hitachi, BurkhalterAssociates, Inc., The Pymatuning Group, Andersen Consulting, theDole Foundation; and several United States governmentorganizations, including the Department of Defense, Department ofJustice, and the Drug Enforcement Administration. Among Mr. Hunt'sother books are Reengineering, Quality in America, and The SurvivalFactor. Mr. Hunt maintains an active schedule as author and internationallecturer/professional speaker on business survival, changemanagement, business process reengineering, process mapping,strategic process improvement, quality management, and productivityimprovement, while serving various industrial companies, governmentagencies, and other institutions as a management consultant. 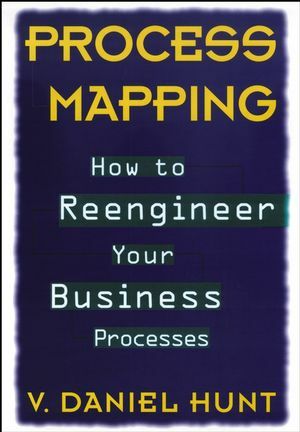 Role of Process Mapping in Reengineering. Do You Really Understand Your Processes? Create a Process Mapping Team. Process Mapping Software Tool Selection. How to Collect Data for Process Mapping.